Feeling a little lonely or left out or overwhelmed on the playground. “The Bee A Friend” bench was Julie Petrynko’s answer to this problem sometimes facing students at, during or after school hours. She is a school counselor at several schools, Tecumseh being one of them. Much of her time is spend engaging students in problem solving and social responsibility instruction. One group of students worked with the school counsellor to learn about making and keeping friends. They decided they could teach their newly learned skills best if they had a meeting place where kids could come to find a friend or find something to do. They talked to the vice principal about a spot and they decided that the old benches by the playground in the process of being removed, needed a facelift and would be a good spot. Lucky for them, the grounds people decided the benches needed to be replaced when the playground was taken down. Students decided on the theme and put in a proposal to Promoting a Culture of Peace for Children to get funding for the project. They were successful. 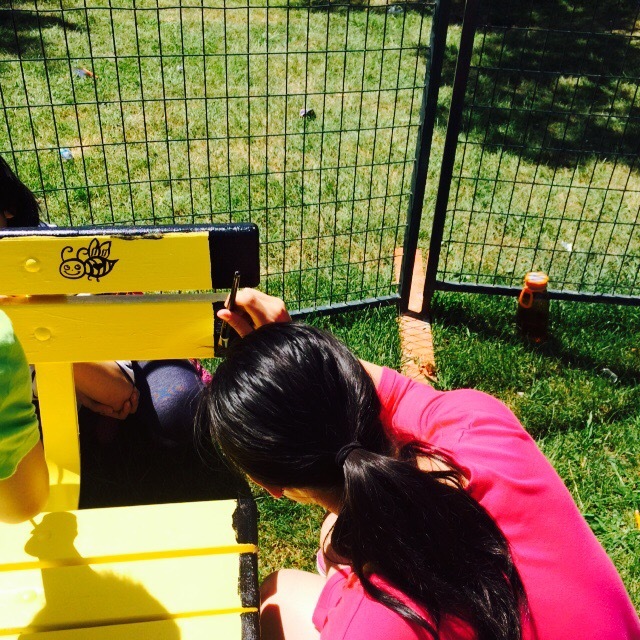 When the weather turned sunny and the playground building area was fenced off, it became the perfect time to paint. The grand opening of the “Bee a Friend” bench was at the same time as the community build playground opening. Grade 7 students and supervision aides introduced it to the Kindergarten students at recess. Then it was opened up to everyone at lunch time. It was a busy place. Bubbles and sidewalk chalk were very popular. The Telus soccer balls donated by girls’ soccer coach, Carrie Serwetnyk, and the happy face frisbees were also very popular on opening day. Students at Tecumseh are lucky because they now have a new playground and fun activities to do. They don’t think anyone will have trouble finding someone to play with NOW! But if they do, they have somewhere to come to and someone to reach out with a smile and an idea.